Janie's Pocono Mountain Garden: Pinching And Pruning.... If You're A Gardener, You Know The Pain. Pinching And Pruning.... If You're A Gardener, You Know The Pain. Hmnn ... every gardener wants their growing plants to produce beautiful flowers. In addition, they want their plants to be full and stocky. The simplest way to do that is to pinch back the young plants. Sometimes, that includes pruning off flower buds that are just forming. Oh, the pain of it .... for the gardener. I hated doing it, but I had to decapitate my mini rose bush. Actually, I have 3 mini rose bushes in separate pots that I had bought on clearance after last Valentine's Day. They lived on top of my curio cabinet all winter, and in late spring I moved them outside. They grew and grew, but I hadn't pruned them back early on. They all became very tall and gangly. I knew what I had to do. This one being the tallest, was the first to get the axe. On July 27th, I brought out the pruners and made a cut halfway down, just above a 5 leafed section of branch. Now August 12th, although still a bit too tall, this mini rose is noticably fuller and sporting new buds. On July 27th I had also pruned back the other 2 mini roses. They, too, look much better and are forming new buds. Now on to a pot filled with annual candytuft. July 14 this pot of candytuft was getting very leggy with smaller blooms. So I used my fingers to make a pinch here ... and a pinch there. Candytuft with a haircut. Not very attractive is it? I kept telling myself I must be patient. Ta Da! August 12 and the plants are once again more compact and covered with new blooms! Cleome! 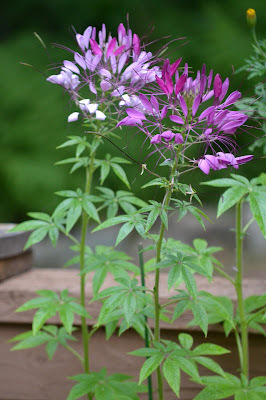 Oh, how I love cleome! I have 3 growing in a large pot on the back deck, and I also have about 10 plants growing in my Boulder Garden. Anyway, the flower heads on the 3 plants growing in the pot were starting to form seed pods. The only way to keep the plants flowering through the summer was to prune off the flowers. On July 26th, I whipped out the pruners and made cuts on each plant about 1/3 the way down to decent sized leaf node. It's August 7th now. Above the cut you can see new healthy growth with additional side shoots. Oh, the flowers will be smaller, but there will be more of them since there is now more than one main flower stalk. I had also pruned the ones planted in the garden and they are growing fast with branching flower stalks, too! Later in the season I will let some of the seed pods develop so I will have fresh seeds for next year. Pinching or pruning back your plants is definitely the right thing to do. Your plants might look a bit unsightly for awhile, but on the plus side, they grow very fast during the summer. Before you know it your flowers will look great again! It's worth the snip!